Tuesday evening report. After a day lounging in Knoxville on administrative leave, Rey was able to return to his apartment Tuesday evening. He had power but no Internet. I was relieved and happy for him. Then I was browsing news reports and found a link to a map showing where some of the buildings that burned were located. One is located just down the road from his apartment. On the map below the marker is a building that burned. Rey’s apartment is about above the word Spring in Spring Valley Road. A bit closer than I had expected. Tomorrow he is to report to work at the Townsend side of the park, away from Gatlinburg. This entry was posted on November 29, 2016 at 11:52 pm and is filed under Uncategorized. You can follow any responses to this entry through the RSS 2.0 feed. You can skip to the end and leave a response. Pinging is currently not allowed. Glad Rey and his apartment are okay. 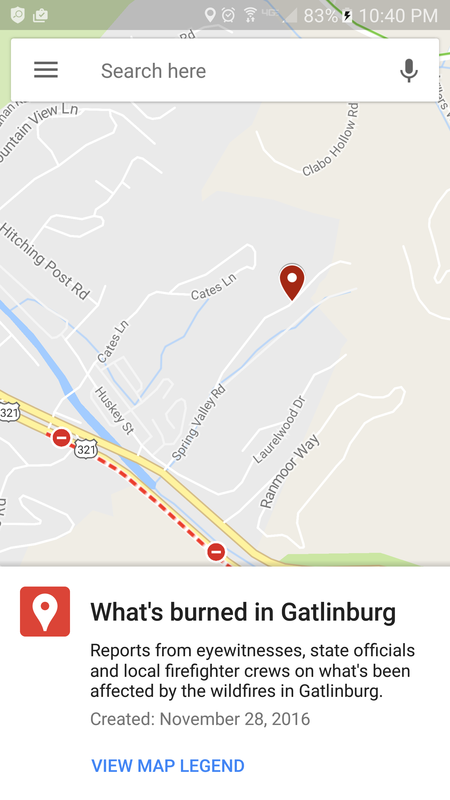 It wasn’t until he facebooked that he was safely evacuated that I realized there were fires in the Gatlinburg area. So scary.